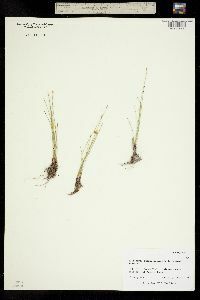 Plants perennial; rhizomes 0.2-1 mm thick, scales persistent or fugaceous, 2-4(-7) mm, thinly membranous, not fibrous; resting buds often present on rhizomes or among culm bases, broadly to narrowly ovoid, 3-6(-10) × 2-5 mm; caudices absent, rarely present, soft or rarely hard, 0.5 mm thick. 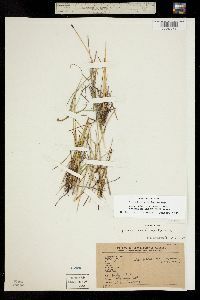 Culms erect, not spirally twisted, not contracted near spikelet, when dry usually with several blunt to acute ridges and sulcate, subterete to slightly compressed, to 2 times wider than thick, 5-35 cm × 0.2-0.5(-1.2) mm, soft to hard; culm tufts often proximally bulbous (if bulbous then tunicated by papery-fibrous scales). 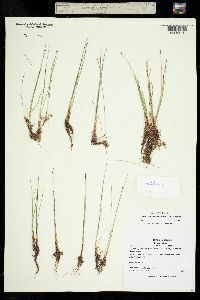 Leaves: distal leaf sheaths stramineous to brown or reddish proximally, green to stramineous or brown distally, membranous to papery, apex often reddish, subtruncate to acute. 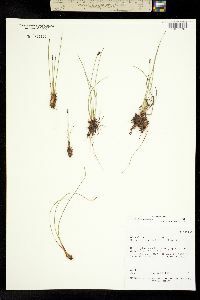 Spikelets 3-8 × 1.5-4 mm; proximal scale with a flower, seldom empty, 2-5 mm, 1/2 or more as long as spikelet; floral scales 3-10 per spikelet, 2.5-6 × 1.5-2.5 mm. 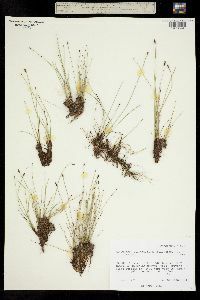 Flowers: perianth bristles (0-)3-6, often unequal, rudimentary to equaling tubercle, stout to slender, spinules dense to apparently absent; anthers 1.5-2.7(-3.5) mm. 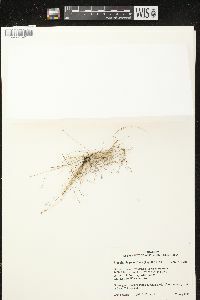 Achenes stramineous to medium brown or gray-brown, equilaterally trigonous to compressed-trigonous, rarely some biconvex, obpyriform (to obovoid), 1.6-2.3 × 0.7-1.3 mm, beak variable. Tubercles rarely absent, 0.3-0.4 × 0.2-0.3 mm. Fruiting (spring-)summer. 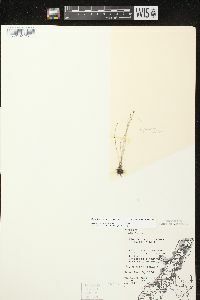 Fens, wet meadows, seeps, springs, hot springs; 0-3600 m; Greenland; Alta., B.C., Man., N.B., Nfld. and Labr., N.W.T., N.S., Ont., P.E.I., Que., Sask., Yukon; Alaska, Ariz., Calif., Colo., Idaho, Ill., Ind., Iowa, Maine, Mass., Mich., Minn., Mont., Nebr., Nev., N.H., N.J., N.Mex., N.Y., Ohio, Oreg., Pa., Utah, Vt., Wash., Wis., Wyo. ; Eurasia. 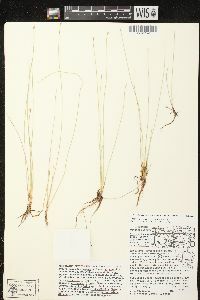 The chromosome numbers for Eleocharis quinqueflora reported for North America (2n = 80) are in doubt because vouchers and other information are lacking. The often-cited n = 10 is probably erroneous. S.-O. Strandhede and R. M. T. Dahlgren (1968) gave 2n = 132 and 134 from Scandinavia. Recognition of infraspecific taxa within E. quinqueflora is premature pending a worldwide revision of subg. 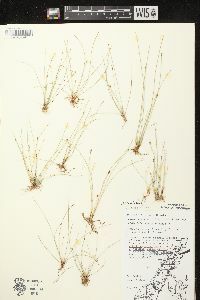 Zinserlingia. 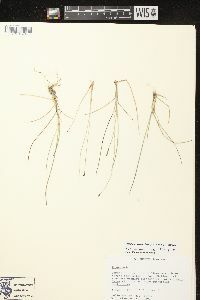 It has been reported from North Dakota, although I have not seen specimens. About five varieties and subspecies of E. quinqueflora have been described worldwide. 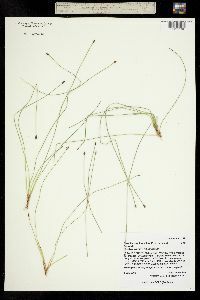 Most specimens from eastern North America and some from the West can be placed in Eleocharis quinqueflora subsp. 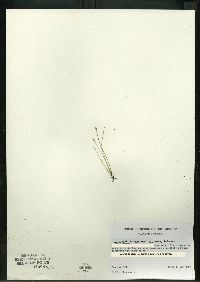 fernaldii (Svenson) Hultén, which is characterized by its small size (culms to 15 cm × 0.5 mm) and small bulbs. 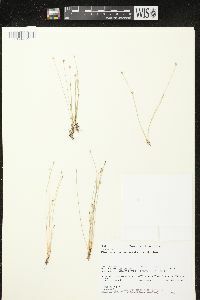 Specimens of E. quinqueflora from 2000-3600 m in California, which are atypical, especially in that the proximal scales of the spikelets do not subtend flowers, may deserve taxonomic recognition. 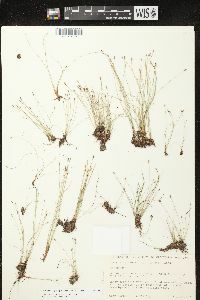 Those plants are also small, with culms only to 15 cm × 0.5 mm; hard caudices are often present at the culm-tuft bases; small, narrowly ovoid bulbs are sometimes present; and perianth bristles are absent or rudimentary. 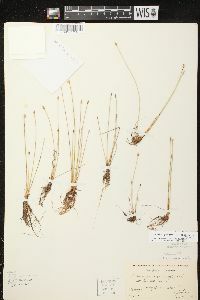 Very few specimens of E. quinqueflora are intermediate with E. suksdorfiana. 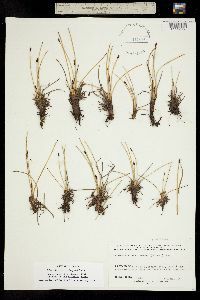 Perennial herb with rhizomes, tufted 5 - 35 cm tall Leaves: reduced to bladeless sheaths, basal, two per culm, margins fused and enclosing culm, straw-colored to brownish or reddish basally, reddish brown at the apex, with a nearly truncate (cut straight across) to pointed apex, papery to membranous. 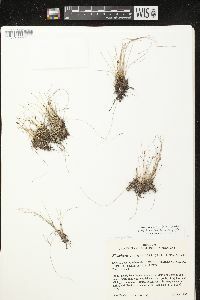 Flowers: minute, spirally arranged on the axis of the spikelet, lacking sepals and petals, with zero or three to six bristles, subtended by a scale. Bristles (when present) often unequal in size, shorter than or equal to the achene, stout or slender. Stamens exserted. Anthers 1.5 - 2.5 mm long. Pistil one. Style three-cleft. Fruit: a one-seeded achene, straw-colored to brown or grayish brown, to over 2 mm long and about 1 mm wide, reverse pear-shaped, three-angled, roughened. Tubercle tiny. Seed with a thin, non-adherent wall. Culm: upright, unbranched, 5 - 35 cm long, to 0.5 mm wide, nearly circular in cross-section or slightly compressed to twice as thick, enclosed basally by two fused sheaths. 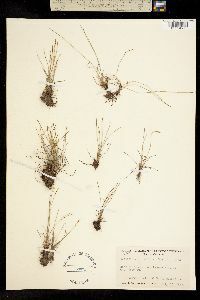 Spikelets: solitary, 3 - 8 mm long, 1.5 - 4 mm wide, egg-shaped, with three to ten floral scales. Scales spirally arranged and overlapping, 2.5 - 6 mm long (bottom scale 2 - 5 mm long), 1.5 - 2.5 mm wide, egg-shaped with a pointed apex. Habitat and ecology: Local along calcareous shores and sometimes forming pure stands. 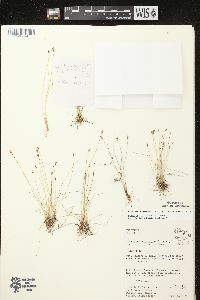 Has been found near a lake in low disturbed ground and also in a calcareous meadow. Etymology: Eleocharis comes from the Greek words heleios, meaning "dwelling in a marsh," and charis, meaning grace. 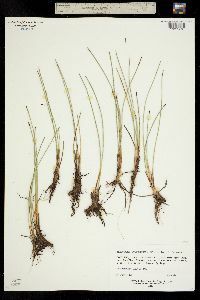 This sedge prefers the wet or moist, marly borders of lakes and, where such a habitat occurs, it is often found in nearly pure stands over large areas. 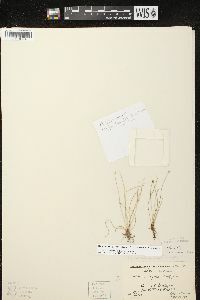 It is also found in a few marshes and along the borders of some of the sloughs in Lake County. It has been reported also from Newton County. 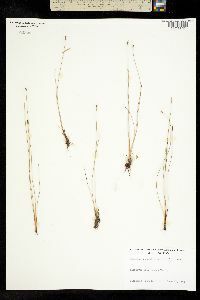 Perennial with clustered stems on a rather short, stout rhizome, also producing long, slender rhizomes with a thickened terminal bud; stems (0.5-)1-3(-4) dm, slender, seldom 1 mm thick distally, not flattened, not proliferous; spikelet ovoid, 4-8 mm, with 3-9 fls; scales ovate, acute to acuminate, 2.5-5.5 mm, the 2 lowest the largest, usually all floriferous; bristles variously longer or shorter than the achene, or obsolete; anthers ca 1.5-2.5 mm; style trifid; achene gray-brown, rounded-trigonous to planoconvex, obovoid, cellular-roughened, 1.9-2.6 mm including the short (to 0.6 mm), thickened, confluent tubercle; 2n=20. Wet calcareous shores and boggy places; circumboreal, s. in Amer. to N.J., Pa., Ind., Io., N.M., and Calif., and in S. Amer.